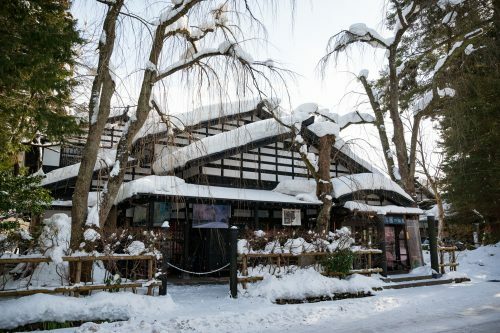 The weeping cherry trees, renowned for their flowing pink blossom covered branches in the Spring, hung heavy with pristine white snow. 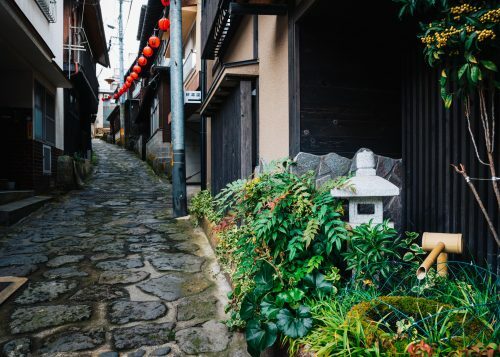 The snowflakes swirled along the street, in sharp contrast to the charcoal colored fences partially obscuring the noble Japanese houses from passersby on the street. 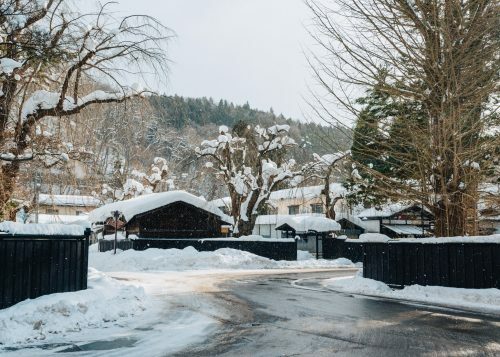 This winter scene was as lovely as an ukiyo-e print as we strolled the near deserted main street of Kakunodate, imagining it coming to life with its samurai residents of centuries past. 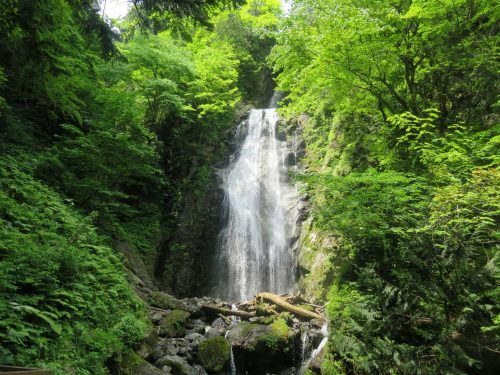 Throughout the Edo period of Japanese history (1602-1868), the Satake clan ruled over the Kubota Domain, which encompassed much of today’s Akita Prefecture in Northwestern Japan. 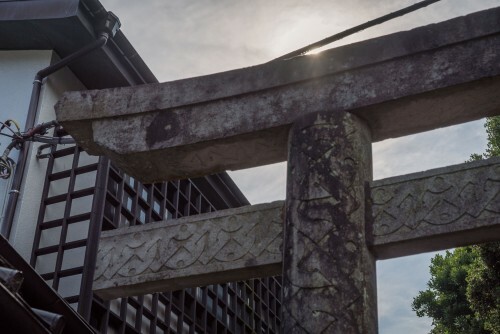 The Satake was a powerful clan, given great responsibility by the Shogun over neighboring territories and the highest level of access to the Shogun in Edo Castle. 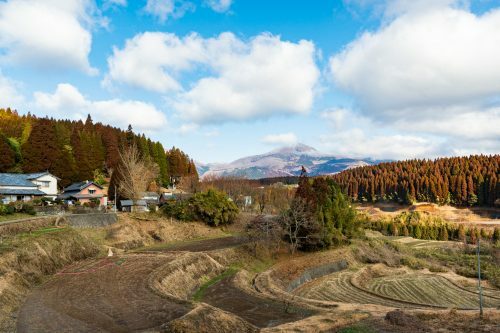 The North Satake family owned a great deal of the land around Kakunodate and partly as a reward to faithful samurai and partly to create a buffer between their estate and the Nanbu Domain in the east, land was given to the samurai to build homes. 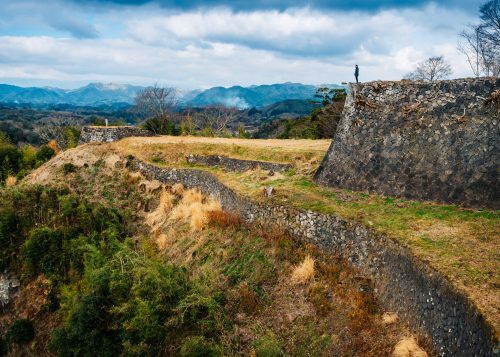 At its peak, there were 240 samurai residences, 60 ashigaru (foot soldiers) residences, 428 merchant homes and 26 shrines and temples in Kakunodate. 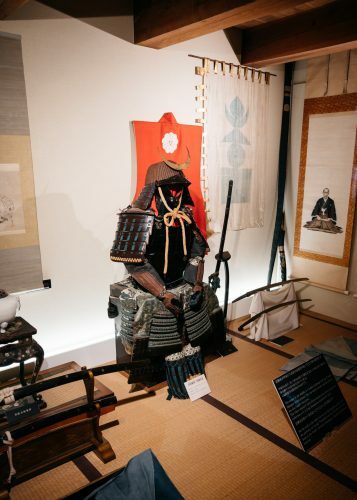 There were many years of relative peace for the Kubota Domain during the Edo period, so samurai began to pursue other interests apart from war; writing, painting and studying the traditional arts were common pastimes for idle samurai during times of peace. 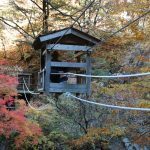 One Kakunodate samurai, Odano Naotake, is best remembered for illustrating the first anatomy reference book ever published in Japan. 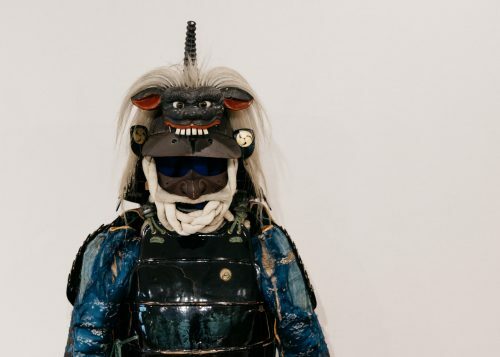 Often wealthy from years of service to their clan, some samurai also amassed extensive collections of unusual items. 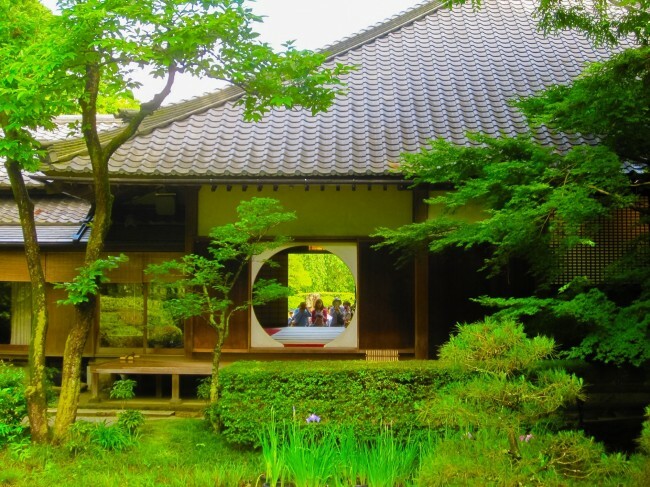 We visited two of the six samurai estates open to the public, the Ishiguro and the Aoyagi family homes. 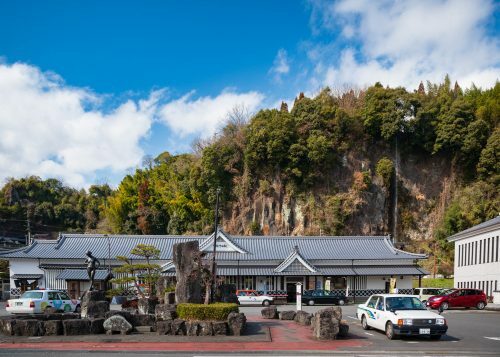 These two estates represent the wealthiest samurai families in the area and have the largest collections of historic items. 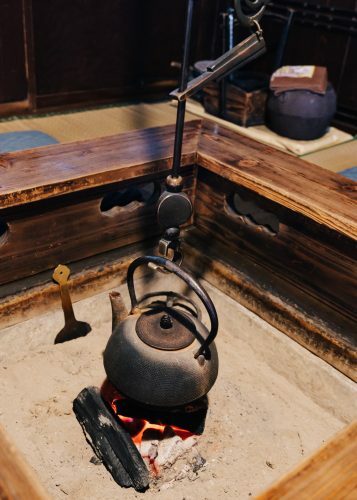 An iron kettle warms over the live coals of the irori in the sitting room of Ishiguro house. 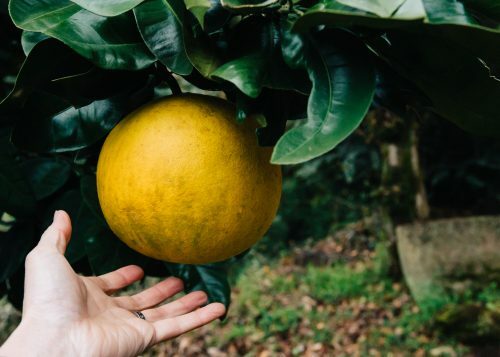 The people welcoming you are not simply employees of the estate; they are the inhabitants. 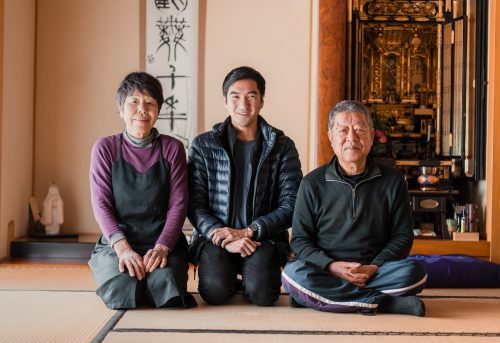 Unlike any other of the samurai homes in Kakunodate, the 12th generation descendants of the original owner still live in a portion of the house. The rest of the house, including the vast storehouse where family treasures were stored, are open to the public for viewing. 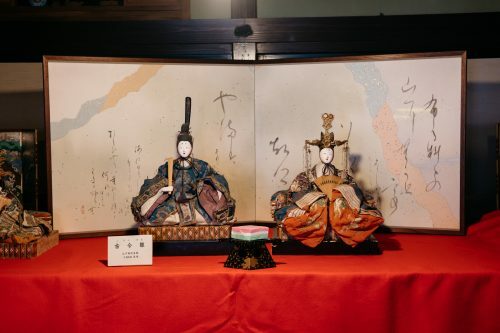 The tour of the house begins with their collection of dolls for hinamatsuri, Girl’s Day, some of which date back to the mid 19th century, on display in one of the rooms. 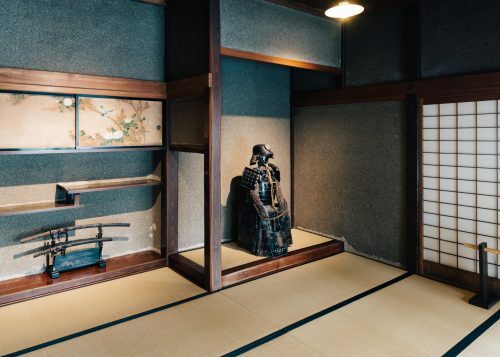 After a quick tour of the rooms open to the public and a glimpse of the garden (which is a bigger part of the tour when it isn’t covered in snow), you are free to roam around the public parts of the house, including out to the storehouse, where you can view ancient treasures like katana sword guards and the aforementioned illustrated anatomy books. 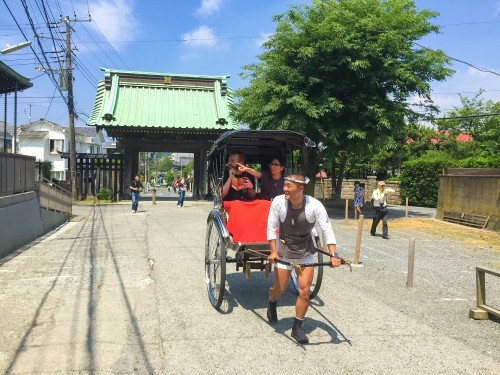 While it is a great experience to be able to explore the ancient town of Kakunodate on your own, having the chance to chat with the staff about the history of their ancestors is a unique opportunity here at Ishiguro. 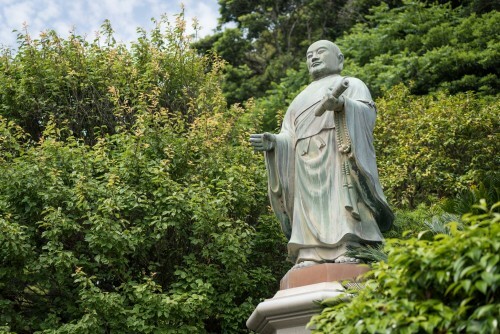 The Aoyagi estate is rightly referred to as a Samurai Museum as the grounds contain almost 10,000 square meters of historic buildings including an armory, botanical garden, several museums and a tea room. 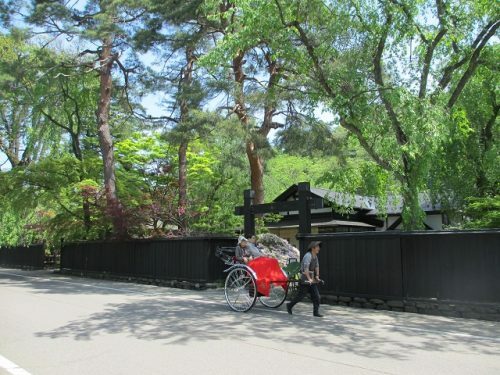 You can tour some of the main house on your own or for an extra fee of 500 yen, opt for a guided tour with a few more rooms available to view and an informative video in English. 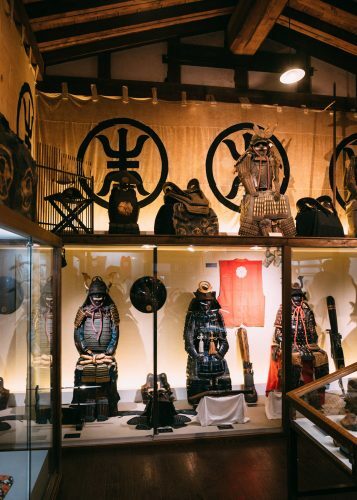 Aoyagi’s armory houses a collection of armor and weapons that rivals many full-sized castles. Clearly the master of Aoyagi was a serious man of war. 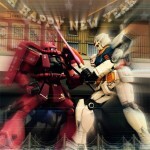 Unlike most museums, however, you can hold a real katana sword in your hand to get that authentic samurai rush. Don’t worry; the sword is encased in a Plexiglas box so there is no risk of losing any limbs to overzealous sword handling visitors. 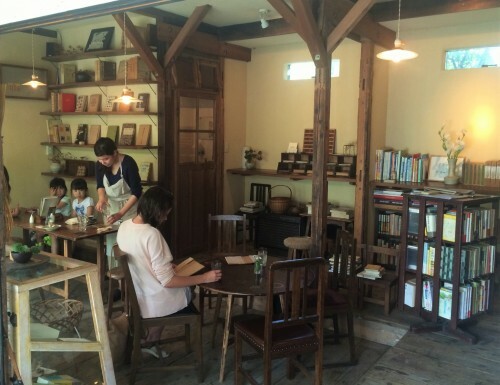 Like Ishiguro’s estate, the storehouses of Aoyagi are opened to share the vast collection of Aoyagi’s former master with the public. 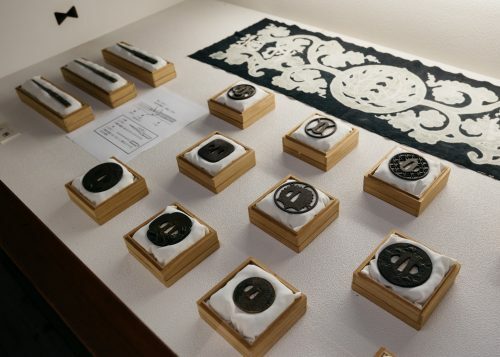 However, the master of Aoyagi had an eclectic taste for objects of Western origin; the collection includes a huge number of clocks, phonographs, and antique cameras. 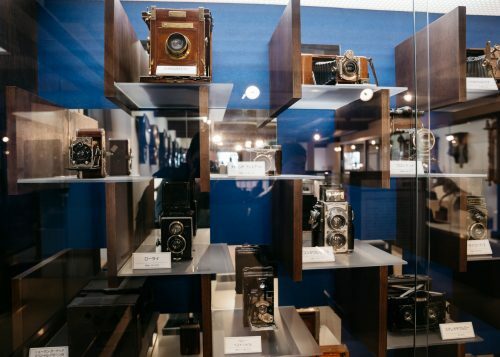 For those fascinated by mechanical antiques, you could spend hours in awe over the collections here. 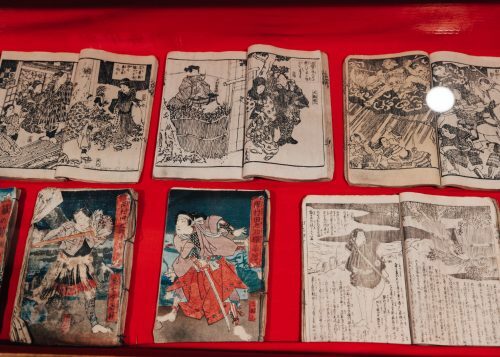 Another rare collection of this estate are what appear to be antique manga, illustrated stories told in paperback books. 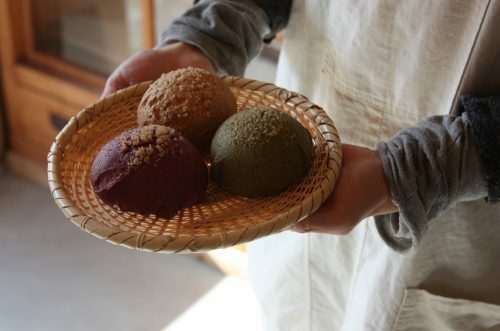 More than a museum, Aoyagi is a place you can also experience traditional Japanese culture (additional fees required). 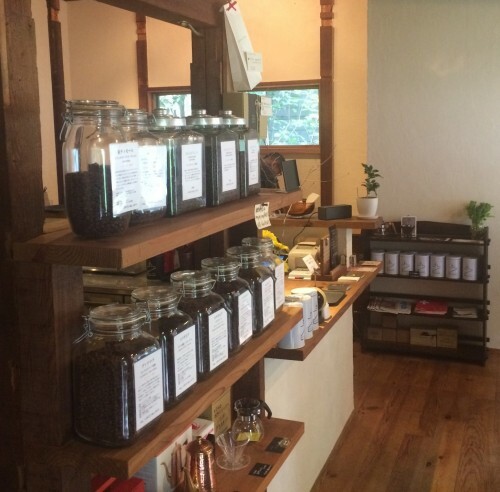 A tea house serves traditional matcha green tea. 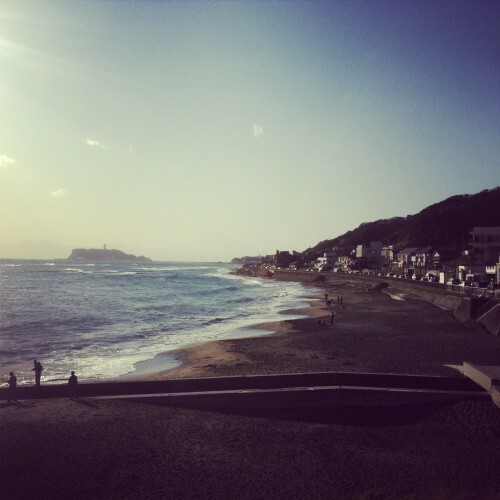 You can dress in kimono or even as a samurai (reservations required). 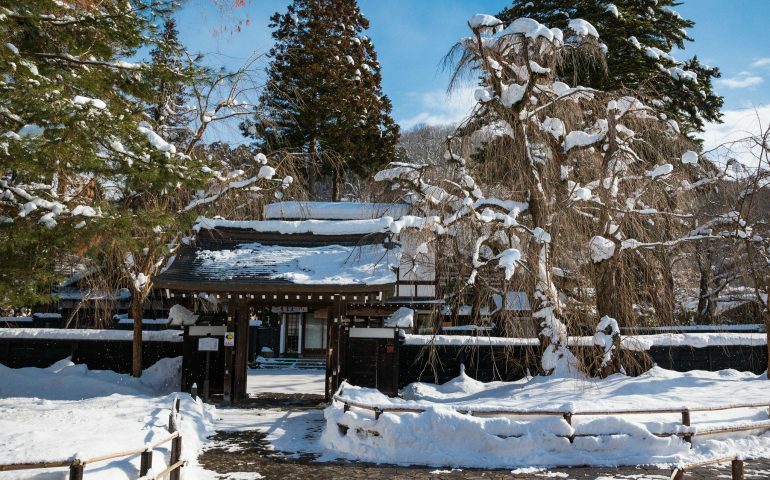 You can write your wish on a wooden placard and leave it at the Aoyagi shrine on the estate. 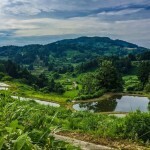 This estate is a beautifully maintained piece of history at which you can experience feudal Japan. 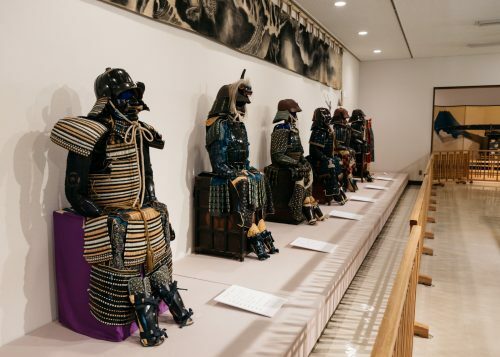 Across the street, the Denshokan (Heritage Center) houses its own collection of artifacts from the Satake clan, including another great selection of samurai armor. 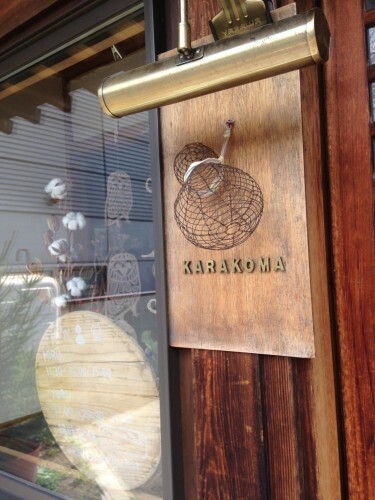 But it is also home to the practice and display of kabazaiku, the ancient handicraft of making objects from polished cherrywood bark. 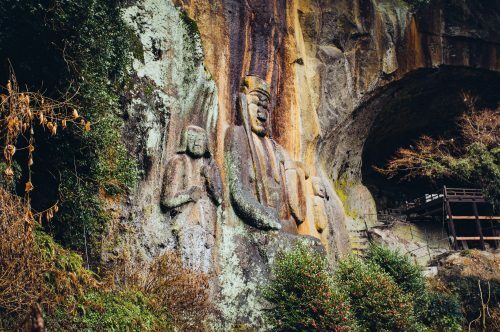 Once a side job introduced by Akita monks to curious samurai, it rose to an art form which has been truly mastered in Akita Prefecture. 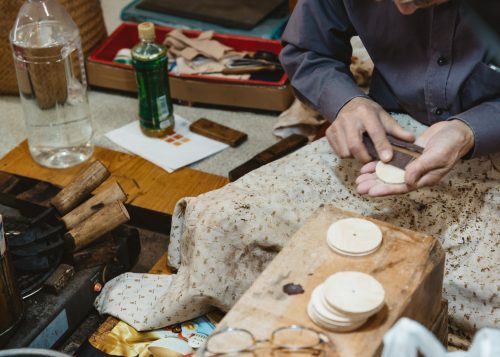 If you are lucky, you might see Suzuki-san, one of several practicing masters of kabazaiku at Denshokan, at work on one of his pieces of art. 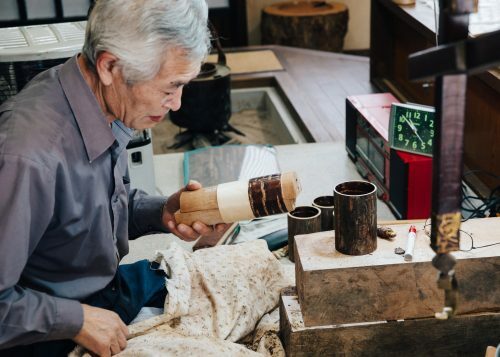 Suzuki-san happened to be working the day we visited and we watched him work meticulously on some lovely tea containers. 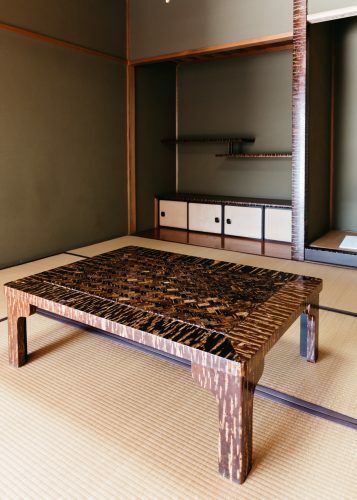 In other rooms of Denshokan, there are examples of other works of art made using this technique including furniture, boxes, and even shoehorns. 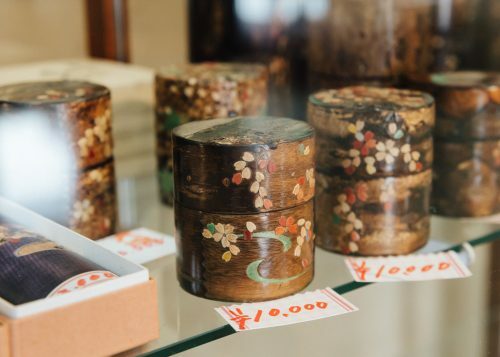 The gift shop carries many of these items created by the local masters ranging in price from a few thousand yen to hundreds of thousands. 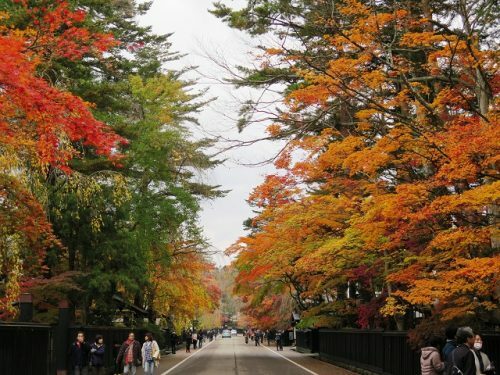 If you mention Kakunodate to a Japanese person, their eyes will light up not because of its samurai history but because of its reputation as a sakura (cherry blossom) viewing destination. 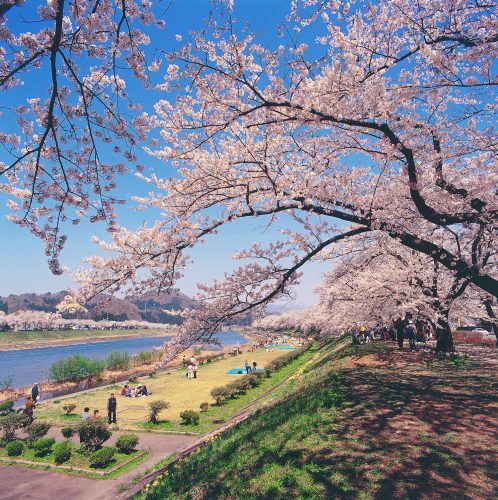 Besides the lovely and rare weeping cherry trees that bloom in the gardens of many of the samurai estates, there is a 2 km stretch of cherry blossoms along the nearby Hinokinai River. 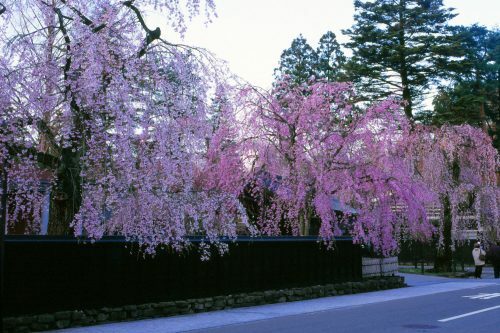 The cherry blossoms of Kakunodate are renowned in the nation of Japan, which of course is renowned for its cherry blossoms in the world, so that is really saying something. 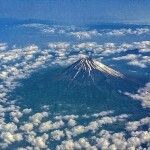 If you are in Japan during cherry blossom season, this is a location you will not want to miss. 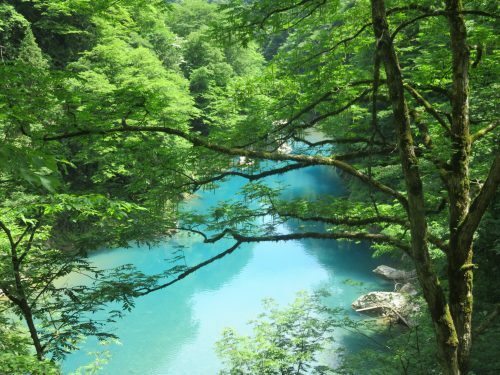 In fact, there is no off-season for a town as lovely as Kakunodate. 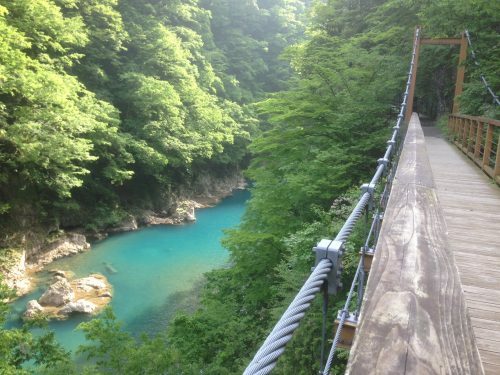 Also in the summer, a hike in nearby Dakigaeri Gorge offers both a bit of respite from the summer heat and breathtaking views from Akita’s oldest suspension bridge and Mikaeri Falls. 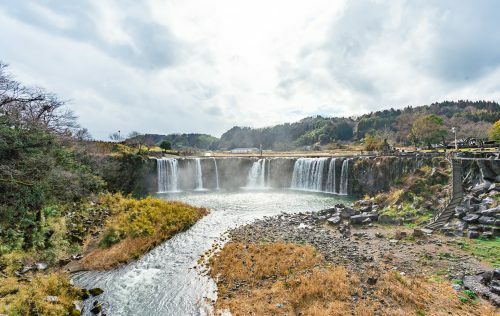 Despite the perception of being a distant destination, the modern wonder of the Shinkansen line actually connects Tokyo to Kakunodate in just over 3 hours. 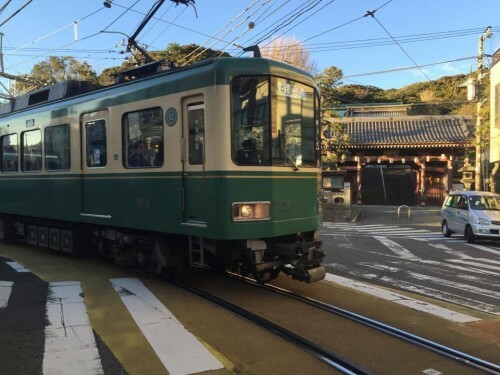 The Komachi bullet train is a direct line from Tokyo that has over 25 departures daily. 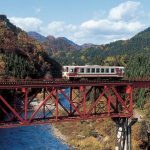 Best of all, the Akita Shinkansen line is covered by the JR Rail Pass, so it is literally a free trip using your pass. 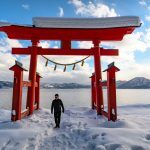 Combined with a tour of nearby Lake Tazawa or exploring nature and onsen hot springs around Tazawako Ski Resort, you can easily make an two or three day trip out of it. 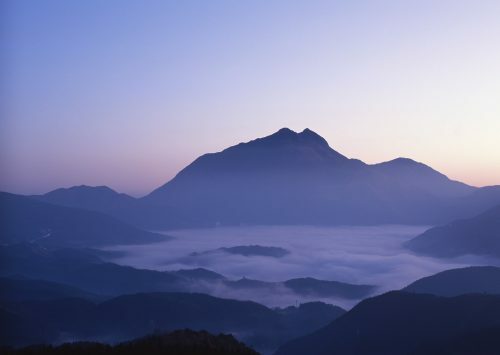 For more information about Semboku City, refer to this official website.